These days, if you buy a not very expensive laptop or desktop machine with Windows installed, then the chances are the version of Windows you'll get is Windows Home Premium. For a developer, this is a reasonable OS to use since it has most of the features we need. But one thing it doesn't support very well is managing local groups. 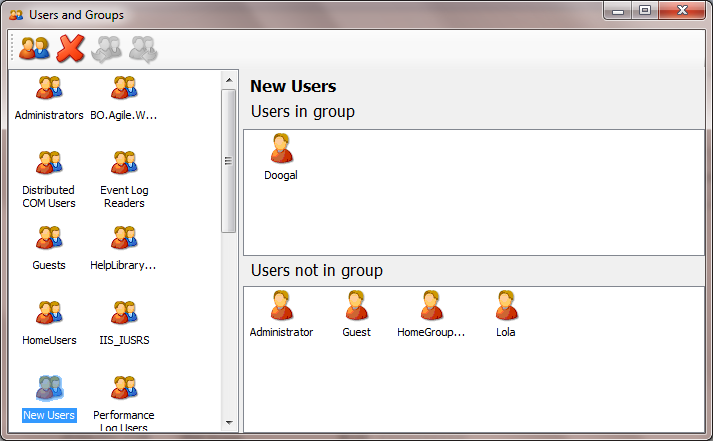 The Local Users and Groups snap-in doesn't work and the only way to work with them is to use the net command line tool. I always forget how to use net so I thought I'd build something better, and here it is. It's a bit rough and ready and only supports adding and removing groups and assigning users to groups, but it served my needs. You'll need .NET 4 installed to run it.